(2012). The Study of Adsorption Characteristics of 1-Chloro-4-Nitrobenzene onto Multi-Walled Carbon Nanotubes Surfaces from Aqueous Solution: Equilibrium and Kinetics. International Journal of Bio-Inorganic Hybrid Nanomaterials, 1(2), 87-92.
. "The Study of Adsorption Characteristics of 1-Chloro-4-Nitrobenzene onto Multi-Walled Carbon Nanotubes Surfaces from Aqueous Solution: Equilibrium and Kinetics". 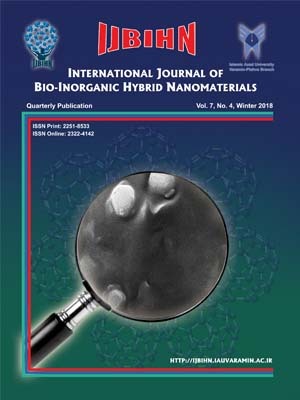 International Journal of Bio-Inorganic Hybrid Nanomaterials, 1, 2, 2012, 87-92. (2012). 'The Study of Adsorption Characteristics of 1-Chloro-4-Nitrobenzene onto Multi-Walled Carbon Nanotubes Surfaces from Aqueous Solution: Equilibrium and Kinetics', International Journal of Bio-Inorganic Hybrid Nanomaterials, 1(2), pp. 87-92. The Study of Adsorption Characteristics of 1-Chloro-4-Nitrobenzene onto Multi-Walled Carbon Nanotubes Surfaces from Aqueous Solution: Equilibrium and Kinetics. International Journal of Bio-Inorganic Hybrid Nanomaterials, 2012; 1(2): 87-92. In this study adsorption of 1-chloro-4-nitrobenzene (CNB) from aqueous solutions onto multi-walled carbon nanotubes (MWCNTs) was surveyed. The effect of some key parameters such as pH (2-10), carbon nanotubes dosage (0.02-0.1 mg/250mL), CNB concentration (2- 16 mg/L), and temperature (20,30,40,50°C) were investigated. The results showed that, the variation of initial pH and CNB concentration exhibits no considerable change onto MWCNTs adsorption process. Results showed that the adsorption is independent of temperature and reveals that the adsorption is physisorption. A trend of increment in adsorption capacity with increment in adsorbent dosage was observed. The adsorption kinetic data were analyzed using pseudo-first-order and pseudo-second-order models. It was found that the pseudo-second order kinetic model was the better model, describing the adsorption kinetics of CNB onto MWCNTs. Adsorption isotherm of CNB onto MWCNTs was determined at various concentration of CNB. Data were fitted to the Langmuir and Freundlich isotherm models and isotherm constants were determined. The equilibrium data for MWCNTs was best represented by the Langmuir isotherm model.